The following is taken in part from a Facebook post, with permission, by my friend Robert Poole. His words so aptly and sincerely describe what many struggling with different levels of mental illness sometime experience from our vantage point. Thank you, Robert, for the reminder that, "It was His touch." A lot of people will tell you that their thoughts and prayers are with you in your time of need. These are words of sincerity and compassion. Jesus used words of sincerity and compassion, as well as love and wisdom to convey his mission and purpose during his ministry. His words gave masses of people hope and joy to their lives. However, it was His touch that raised people from the dead, fed the masses when they were hungry, healed the sick and quieted the confused. This tells me that one's human touch is important, perhaps more important in some situations than words so easily scripted by some. Why? 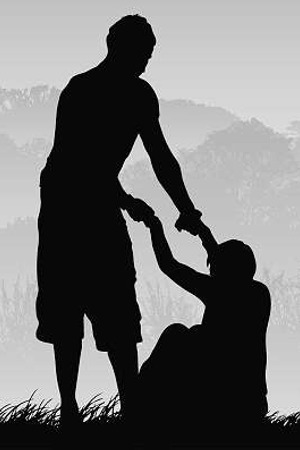 Because the act of helping someone, human emotional and physical contact, often compel a more personal investment in the other person. The currency of touch requires more; more of one's time, emotions, commitment and trust. An impassioned plea from my friend, Robert, that in addition to our prayers of support, to do our best to get involved when we see someone hurting. Words without action can be fleeting. The Lord won't send you where He is not already. Will you be His touch for someone today?